Built in 1939, the Marine Drive Apartments, now called 5040-5060 North Marine Drive Condominiums, is an impressive example of Depression Era Modernism. Photo by Eric Allix Rogers, 2017. Discovering a great historic building or site can be a lot like making a new friend. As you explore and learn more about the place, you become even more intrigued. And it’s especially exciting if this place has been hiding in plain sight. That’s what happened to me this summer while working on a historic resources survey of buildings along North Lake Shore Drive. As I began researching the Marine Drive Apartments, now called 5040-5060 North Marine Drive Condominiums, I was immediately fascinated. I soon shared my excitement about this structure with a few friends from the Edgewater Historical Society. They introduced me to some owners of condominiums there who graciously offered to give me a tour. I invited Eric Allix Rogers from the Chicago Architecture Foundation and a couple of other friends to join me. After plenty of oohing and aahing, Eric asked the owners if the Chicago Architecture Foundation could include the building on Open House Chicago this year. And they did! This aerial view shows the newly extended Marine Drive from Montrose to Foster avenues. The Marine Drive Apartments can be seen at the very top of this photo (just left of the 1923 Aquitania Building), ca. 1940. Chicago Park District Records: Photographs, Special Collections, Chicago Public Library. The eight-story-tall structure, which faces Lincoln Park, is an impressive example of Depression Era Modernism. By the late 1930s, Chicago was in the midst of a terrible housing crisis, especially in Uptown on the city’s North Side. A recent landfill expansion of Lincoln Park and extension of Marine Drive provided a desirable location for new apartment buildings that would have views of the park and Lake Michigan. The Marine Drive Apartments, built just south in 1939, was one of the few structures actually erected in the area at the time. Architects Samuel S. Oman and Samuel Lilienthal not only designed 5040-60 N. Marine Drive, but they also developed the building. The pathway shown here leads to an exterior entranceway to one of the building’s six elevators, 2017. Photo by Julia Bachrach. Architects Oman & Lilienthal, who first formed a partnership in 1923, had grown up on Chicago’s West Side where they attended Crane High School together. Samuel S. Oman (1897–1943), a Russian Jewish immigrant, settled in Chicago with his family during childhood. Samuel Lilienthal (1898-1947), whose parents were Russian Jewish immigrants, came from a similarly modest background. By the time he started high school, Lilienthal lived with four siblings, his grandfather, and a cousin, while his father did odd jobs and house painting. The two aspiring architects attended the University of Illinois. Oman earned a Bachelor’s degree in architecture and Lilienthal received an engineering degree. Prior to entering into their partnership, Oman practiced alone, and Lilienthal worked in the office of Fridstein & Co.
After the young architects formed a partnership, they found quick success. By the late 1920s, Oman & Lilienthal had received several commissions to design luxury apartment buildings. After completing several fine cooperative buildings at 507-19 W. Aldine Avenue, 444 W. Belmont Avenue, and 2130 N. Lincoln Park West, they had become known as “pioneers in the field of cooperative apartments.” Oman & Liliethal’s prosperity allowed them to develop as well as design two of their most prominent buildings, the 1926 Eastgate Hotel and the 1928 St. Clair Hotel. 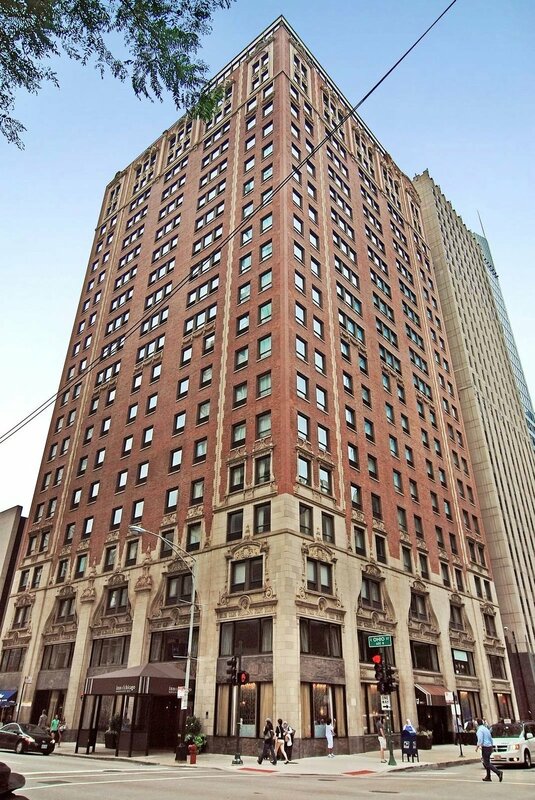 The 15-story Spanish Baroque style Eastgate (now known as Red Roof Inn) at 162 East Ontario Street, and the ornate Revival style 21-story St. Clair (now Inn of Chicago) at 162 East Ohio Street were considered two of the city’s most impressive hotels. Oman & Lilienthal became well known for designing luxury rental and cooperative apartments in the 1920s, including 444 W. Belmont Avenue, Chicago, IL. Oman & Lilienthal, architect. McNally & Quinn Records, Ryerson and Burnham Archives, The Art Institute of Chicago. Digital File #198002_150806-015. The Hotel St. Clair is now the Inn of Chicago, 2016. While many local architecture firms barely survived the lean Depression years, Oman & Lilienthal fared better than most others. Their late 1930s work included remodeling the Chicago Loop Orthodox Synagogue and designing a West Roosevelt Road movie theater as well as several large North Shore homes, including Oman’s own house in Winnetka. The Marine Drive Apartments project not only represented an important design commission but as part owners of the new building, the two architects also had a significant financial stake in the project. 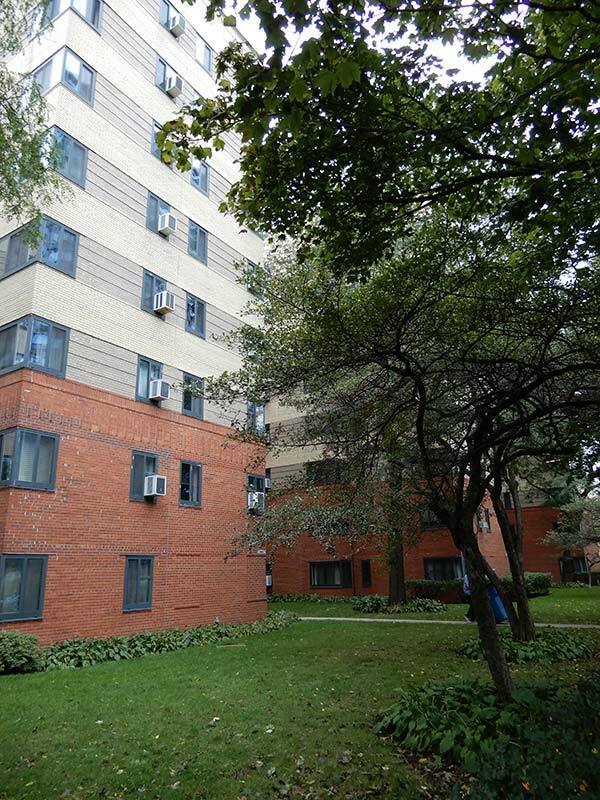 Touted as “ultra-modern,” units in the Marine Drive Apartments had lots of natural light and ventilation and great views of Lincoln Park. 5040 N. Marine Dr., Chicago, IL, 1939. Oman & Lilienthal, architect. Earl H. Reed, photographer. Historic Architecture and Landscape Image Collection, Ryerson and Burnham Archives, The Art Institute of Chicago. Digital File #U527952. 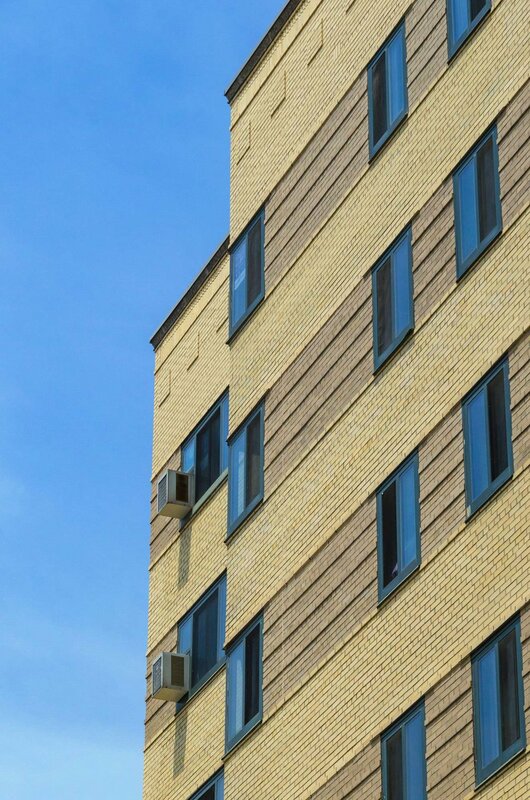 The artful use of brickwork creates a visually pleasing contrast between horizontality and verticality. Photo by Eric Allix Rogers, 2017. Interior decorative elements include the initials of the original Marine Drive Apartments name. Photos by Eric Allix Rogers, 2017. 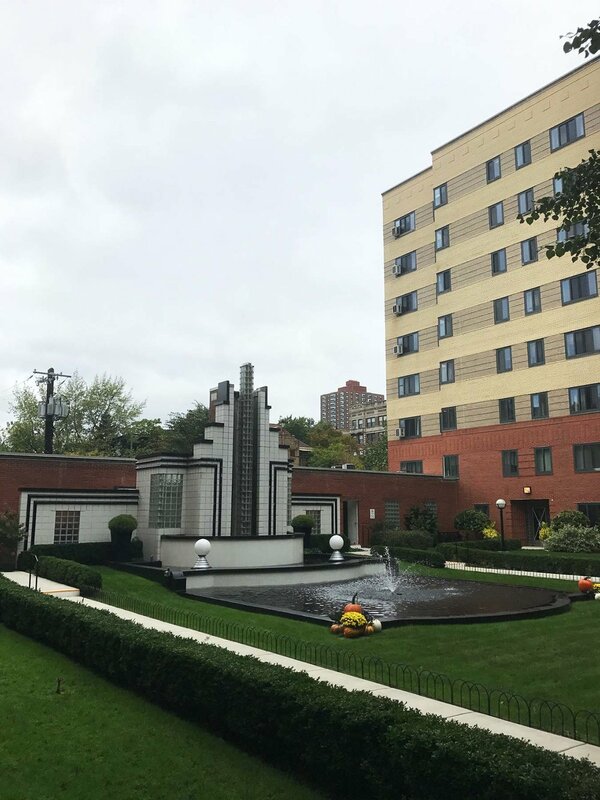 Although the original fountain was designed in a more restrained Art Moderne style than its 1990s “reinterpreted Art Deco” fountain, the feature continues to provide a delightful attraction in the center courtyard. Photo by Bonnie McDonald, 2017. The building’s courtyard has always been one of its most enticing spaces. Oman & Lilienthal’s original design featured an Art Moderne style fountain with semi-circular tiers rising above a large rectangular reflecting basin. Ducks often swam in this large reflecting pool. Lushly-planted flower beds edged the fountain and enlivened this shared outdoor space. The original fountain had fallen into disrepair by the 1970s, causing the building managers to make repeated plumbing repairs. In the early 1990s, a “reinterpreted Art Deco style” fountain replaced the original feature. The substitute fountain’s black, white, and glass block motif ties in well with the building and the low garage wall that stands behind it. Shortly after the building’s completion, Samuel Lilienthal and his wife Rose moved into a large unit at 5060 Marine Drive. The architects’ third partner, Albert J. Tarrson, also moved in with his family. The Oman family lived in Winnetka, but after Samuel S. Oman died in 1943, his widow, Janet T. Oman, also lived at 5040 North Marine Drive. Sadly, the Lilienthals died tragically in a plane crash in 1947. This view shows the two Lindens Ed McDaniel planted over 30 years ago. Photo by Julia Bachrach, 2017. The Marine Drive Apartments became condominiums in 1978. Since that time, the building has consistently been inhabited by enthusiastic resident owners who cherish this Modernist treasure, especially its remarkable courtyard. One owner, Ed McDaniel, a noted blues bassist, became smitten with the building when he visited his relatives who lived there when he was a teenager. Ed wanted to help attract birds to the courtyard, so he got a couple of Linden saplings and planted them, never thinking they would survive. Today, along with his neighbors, Ed McDaniel enjoys seeing the 30-year old Lindens still standing majestically in the courtyard. If you’re as intrigued with the Marine Drive Apartments as I am, check out this home movie, from the University of South Carolina library archives, with video footage of the building at 9:05. I hope the building will be featured on Open House Chicago again next year so that you can have a chance to explore this fabulous example of Depression Era Modernism!